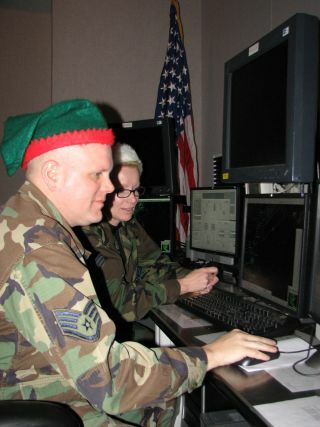 Two members of NORAD's Northeast Air Defense Sector get ready to track Santa Claus using radar equipment in December of 2008. If you thought the government shutdown meant you could work in secrecy today (Dec. 24), Santa, think again. The North American Aerospace Defense Command (NORAD) continues to operate its famous "Santa Tracker" website despite the partial shutdown, which went into effect when the clock struck midnight on Saturday (Dec. 22). You can also follow Santa's frenetic journey around the globe via the "NORAD Tracks Santa" Twitter account, @NoradSanta. NORAD, a joint effort of the United States and Canada, has been monitoring Santa's reindeer-powered movements since 1955. That year, a Sears store in Colorado Springs ran an ad in a local newspaper that included a phone number kids could dial to talk to Santa. But that number was a misprint: It actually routed children to the director of operations at a Colorado Springs facility of NORAD's predecessor organization, CONAD (Continental Air Defense Command). The man who answered those initially confusing calls, Col. Harry Shoup, displayed some admirable Christmas spirit, and a tradition was born. Nowadays, NORAD tracks Santa using all sorts of high-tech gear, including radar dishes, satellites and strategically placed "SantaCams." NORAD team members also gets lots of help from volunteers, which is how they're able to keep the red and green lights on every holiday season. NASA isn't getting through the shutdown similarly unscathed; about 95 percent of space agency personnel will be furloughed, including the folks who run NASA TV. But NASA will continue to support its many operational spacecraft and keep these missions' data flowing. So, the OSIRIS-REx probe will still begin orbiting the asteroid Bennu on Dec. 31, and the New Horizons spacecraft will still fly by the distant object Ultima Thule at 12:33 a.m. EST (0533 GMT) on Jan. 1. And you'll be able to keep close tabs on the Ultima Thule encounter even if the shutdown continues into the new year; the Johns Hopkins University Applied Physics Laboratory, which manages the New Horizons mission for NASA, will webcast all flyby-related events if NASA TV remains offline.